Toothcleaning by Margit Sablowski: Wow – what a great shot! This cleaner shrimp is in such sharp focus and the shot is perfectly timed as the shrimp ventures into the moray’s mouth. Lovely! Sealion in La Paz by Margit Sablowski: I am a sucker for a sealion, and this is a lovely portrait of one with the whole animal in shot. Gorgeous expression on the sealion’s face, beautiful image. Meeting a vegetarian by Alisha Postma. I like this fish portrait. It is not easy to get the lighting right on shiny silver fish and you have done this very well, along with the black background, this really stands out. Sandy Sea by Sean Steininger: A different perspective and an unusual shot of this shark. I love the movement the curve of the shark portrays. Water in a Well by Sean Steininger: Great shot! 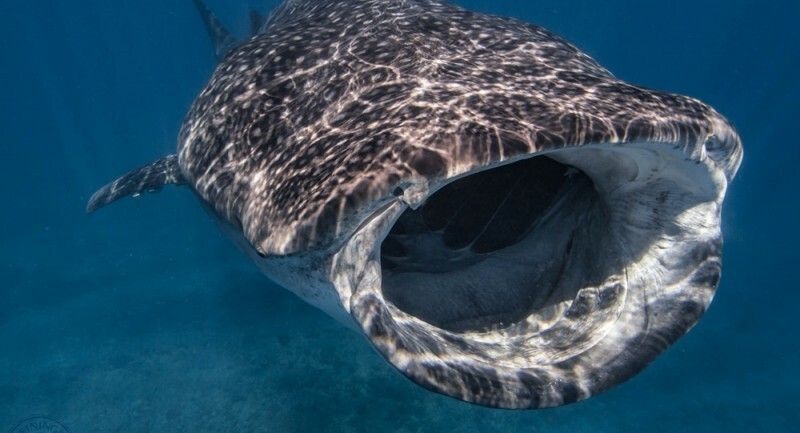 You got the whole whaleshark in the shot and have caught the shark with its mouth wide open. Lovely. Arrow Squid by Gian D’Andrea: This is an incredible shot from a black water dive. The colours and lighting are great, especially considering the challenging conditions. Hippo by Marc Eeckhaut: Lovely shot of a pygmy seahorse. Great focus on the eye and face of this tiny and adorable creature. The pink stands out perfectly on a black background. Best Friends by Marc Eeckhaut: Another lovely macro shot from Marc with excellent lighting. I just hope the shrimp has not been moved to this location. I painted this myself by Daryll Rivett: I love the colours standing out against the black volcanic sand of The Lembeh Strait. It is hard to light tiny creatures well in these conditions. Well done. Lonely Jellyfish by Glynn Philipps: I love this jellyfish set against the sandy background. It looks like it is leading us somewhere – perhaps to its alien spacecraft! Forever Dolphin Love by Martin Moscovich: What an amazing encounter and this image captures that magical moment well. Congratulations to the those who were placed – some really nice images here, and well done to all those that entered. We cannot wait to see what October has to offer. Scubaverse.com’s October 2018 Underwater Photo Contest is now open! Enter as many as three of your underwater photos here.